As part of the re-design and re-installation of its Natural Sciences galleries, the Oakland Museum of California worked with Earprint to develop a multimedia exhibit component to bring the Cordell Bank National Marine Sanctuary to life. The Oakland Museum was trying to give access to places that the average person cannot actually go, and Earprint was eager to participate in that effort. The Cordell Bank is an underwater, coral-topped mountain west of Point Reyes, a national seashore in Northern California. This underwater mountain is inaccessible to anyone but avid divers and researchers, and virtually unknown outside of those circles. The Oakland Museum hoped to educate visitors about this mysterious and otherworldly ecosystem that was right outside their front doors, and asked Earprint to help with this task. Earprint was thrilled to participate in this project, and directed our team of experienced professionals to design and produce media for three exhibits about the Cordell Bank grouped based on their depth — Surface, First Dive and Deep Ocean. “Surface” uses interactive iPad videos to show visitors stories of the people whose lives revolve around the surface ecosystem. This includes stories from a fisherman, a sea captain, an ecologist, and a biologist, who all interact regularly with the surface area around the Cordell Bank. “First Dive” immerses visitors in an audio experience in which they hear oral histories from the NOAA divers who first explored the underwater world of Cordell Bank. In-gallery headphones deliver extended versions of the First Dive interviews for visitors who are interested in learning more. 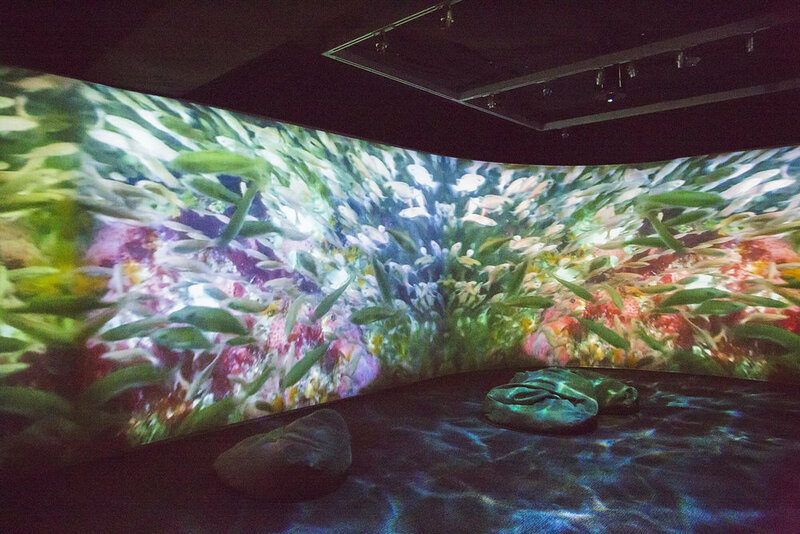 The “Deep Ocean” soundscape was designed to accompany a video installation created by artist Olivia Ting and inspired by Cordell Bank’s underwater life. The Soundcloud sample below combines diver interviews with sections of the deep ocean soundscape. Earprint dove deep into each of these environments, collecting oral histories from archives and the individuals profiled in the exhibit, blending them all together in cohesive and appealing video and audio formats, and presenting them in unique and interesting ways for visitors to the Oakland Museum. Earprint prides itself on its ability to provide dimensional experience design services, allowing clients like the Oakland Museum of California to create an environment of immersive storytelling for visitors. Earprint’s unique focus on blending audio, visual, and other sensory input allows for a fully immersive experience that is unparalleled by purely visual formats. As we probe deeper into the future of dimensional experience design and assist clients in further pushing the boundaries of visitor experiences through various senses, we look forward to building complex connections between visitors and the world around them.